Getting your nails done is such an instant pick-me-upper. Lately, I’ve been feeling so unpolished but at least my nails are looking pretty darn well-manicured (and as I’m typing this Ms. Z just scribbled red permanent marker all over my arm!). That’s the story of my life as of late…unpredictable & messy. 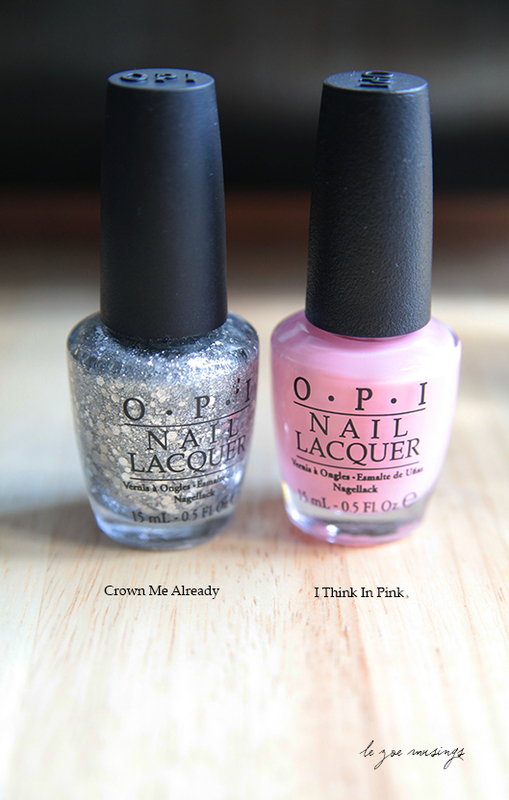 Here’s how to get the cascading sparkling effect: 2 coats of I Think In Pink, 2 coats of Crown Me Already on the lower 1/3 of your nails, 1 thin coat of Crown Me Already on the lower half of your nails. Oh, and don’t forget your regular base and topcoat of choice! That is such a beautiful effect. Must try! Love this- I wish I was talented enough to paint my nails without smudging them. Reblogged this on Vanity Catwalk. An excellent dose of fun for a Monday! I need a bottle of Crown Me Already in my life- all about the sparkle! Super cute! I love the finish on this!